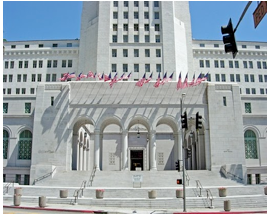 When visiting LA's City Hall, keep in mind that the beautiful front doors on Spring Street are for the exclusive use of City Hall staff while the back doors are for the public. This "two-tier" system of access is an apt metaphor for the double standard that applies to those who govern Los Angeles and to those who are governed. Consider the tremendous display of irony at Monday's Board of Neighborhood Commissioners' Retreat when the General Manager of CDD reported that the money to fund the training of neighborhood councils on the management of NC funds somehow fell from the proposed budget, something he glossed over as a "mistake." This "mistake" somehow made it into the Mayor's proposed budget, made it all the way to the City Council, and is now on its way back to the Mayor for final approval. The board retreat opened with a commitment to Transparency and Accountability and a mandate to address the impact of the proposed merger of the departments of Community Development and Neighborhood Empowerment on the Neighborhood Council system. The 7 Commissioners were surrounded by 3 staffers from the Mayor's office, 5 staffers from Neighborhood Empowerment, 3 staffers from Community Development, 2 staffers from the City Attorney, and the retreat was facilitated by 2 staffers from Human Relations. Whew! 15 people on the clock to facilitate a board retreat for 7 Commissioners and about a dozen members of the public. Yet nobody sounded the "Transparency and Accountability" alarm when it was revealed that a Deputy Mayor and two General Managers allowed the budget for Neighborhood Empowerment to make it all the way through the system without doing the math. It may be "budget dust" in the grand scheme of a $7 billion budget but for the neighborhood council system, $84,000 is significant. More important than the loss of the Neighborhood Empowerment NC training budget is the fact that the very people who sit in a position of authority, contemplating "drastic measures" for the volunteers of neighborhood councils such as imposed mandatory training and funding suspensions, are not bound by the same performance standards. The proposed Neighborhood Council review system, where city staff would rate councils and determine if they are "Low Functionality" or "Medium Functionality" or "High Functionality" and then prescribe appropriate measures for addressing their performance, should be turned on its ear and applied to those in City Hall. The proposed matrix of performance standards is not bad. It reviews everything from Funding to Outreach to Collaboration to Technology. It's just aimed at the wrong people. Now is the time to ask the hard questions of those folks who use City Hall's front door. It starts with "Where's the money?"